Last night's Republican presidential debate kicked off with Newt Gingrich apparently blaming his marital infidelities on the media. How dare CNN and its sinister fellow travelers in the so-called 'elite media' dare to question Gingrich's integrity by raising the latest revelations of his second wife, he thundered? 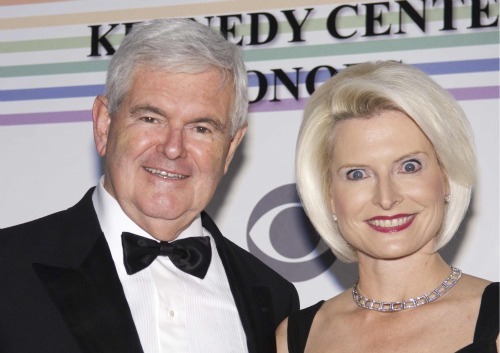 Gingrich was not there to discuss his requests for an open marriage. To underline that point he then brought both CNN and host John King to the woodshed. It's always so much easier to condemn other people's infidelities. After all, Gingrich has admitted to having an affair with a Congressional aide (his current wife Callista Gingrich) while leading the impeachment proceedings against President Bill Clinton. Whilst leading the charge to have Clinton removed from office for having an affair, Ginrich was having an affair. Living in his glass house, he's never been reticent about throwing stones at everyone else, in other words. After his fiery how dare you speech last night, most - although clearly not all - of the audience at the debate gave him a standing ovation. He's fooling himself if he thinks America will do likewise. Morality doesn't stop being morality when it's Republican election season. Gingrich has positioned himself as both a champion of marriage and traditional values, and neither of those suggest you approach your wife for her blessing on your affair. As columnist Dan Savage has memorably put it, when it comes to matters of tradition, sexuality and marriage, Ginrich's rule seems to be: Screw as I say, not as I screw. It will be instructive to see if he can gain a Hail Mary pass for behavior he has condemned loudly in others for decades. The many marriages of Newt Gingrich --who is next Hannah Montana?